What is LinkedIn? Should You Use LinkedIn for Your Business? If you’ve read our article about digital marketing and social media, then you know how crucial having social networking sites can be in promoting your business. Not only will these social pages allow you to reach millions of people at once, but they also help you tweak your marketing approach and strategies according to your targeted demographics. For instance, Pinterest’s active users are said to be mainly women because of the site’s more visual interface and content. This allows fashion companies to show off their products using compelling images that women would want to “pin” on their own boards. By knowing that Pinterest’s users are made up of approximately 70% women, you instantly get an idea of how to market your wares for this demographic. Other social sites, like Instagram and YouTube, have more users who are part of the youth segment and young professionals. And sites like Facebook and Twitter, both having large numbers of members, have mixed demographics. For business purposes, you may want to look at Google+, but aside from this, you can also check out LinkedIn. What Is LinkedIn and Why Do I Need It? LinkedIn describes itself as the world’s biggest professional network. In 2014, LinkedIn reported that it had reached over 277 million users from 200 countries. More recently, LinkedIn reached a milestone in the UK, where it has fifteen million users and counting. It can be accessed in twenty languages, including Tagalog. The number of users might seem small when compared to the top social networking sites, but then again, what you should focus on here is the fact that the users of LinkedIn are professionals. This means that a large percentage of these professionals could be influential people who can drive traffic to your company website by their recommendation and support. You can also arguably assume, based on the type of professions on LinkedIn, that a good number of them earn more than $100,000 a year. There’s really no problem when it comes to disposable income among the consumers you can reach on this venue, which gives all the more reason why you should consider promoting your products and services using this platform. Let’s not forget that having an effective LinkedIn company page can also increase the ranking of your website on the SERPs by association. As LinkedIn specializes in business, whenever someone searches for your company or products and services, there’s a good chance that search engines will bring up your LinkedIn company page, which will then lead people to your business’s official website. If you’re ready to create a LinkedIn profile for your company, go here, and click on “Get Started”. Before creating a company page, a personal account from which you will manage this company page is required. When you click on “Get Started”, you will first be prompted to create one or log in to an existing LinkedIn account. Today, you can log in using your Facebook account. Again, it’s recommended that you use or create pages exclusively for your business, rather than only using your personal ones. Oh, and creating another brand page does benefit your main website in terms of SEO. Once you have logged in to your LinkedIn account, you will see a tab called “Companies”on the dashboard. Click on it and from there, you can click on “Add a Company” to proceed with making a business page. As you can see, you are required to use an email address with the name of your company as a domain. This will be used for identification and verification purposes to make sure that you are from that business, rather than creating a listing for other companies for the purpose of sabotage. 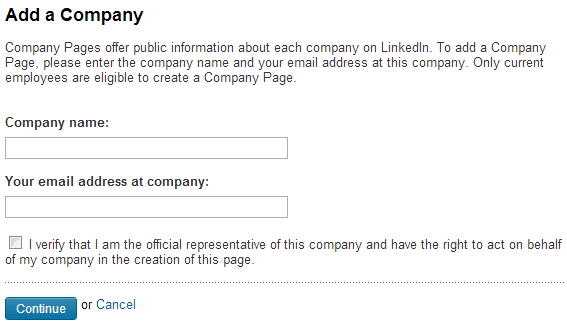 Once you’ve added the company page, you can now tweak your LinkedIn company page to your liking. Every time you access your company’s profile, you will see a button on the upper right side that says “Edit Profile”. Here, you can add more information about your company and designate other administrators as other company heads, if applicable. Aside from the company information that will be made visible on your page, there’s also a “Products & Services” tab that you can edit to give people an idea of the nature of your business. In the business world, it pays to be very specific about your brand offerings by encouraging people to identify with your products and services. As a final note, you might encounter that you just can’t create a company page. Simply go back to your personal profile, make sure it’s filled up to at least 50%. Try to complete it as much as you can though. Next thing to do is have several connections, usually, 10 is enough. You should be able to create your company’s business page by then. Now that you’ve made a LinkedIn company page for your enterprise, the next step would be to use it to promote your official website. Before you learn some of the best practices in LinkedIn marketing, you first need to know that there are two types of LinkedIn marketing, namely: passive and aggressive. Again, if you’ve read our articles about digital marketing, it will be easier for you to distinguish between the two. 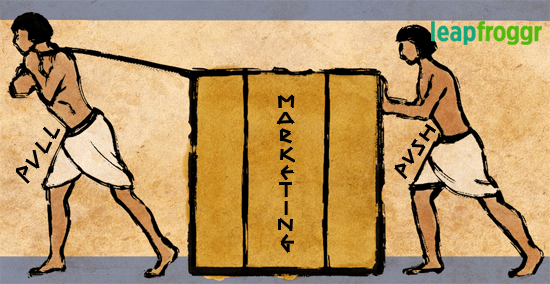 In this case, passive marketing is similar to pull advertising, while aggressive marketing can be likened to push advertising. Both passive and aggressive marketing methods take work: pulling weight is still labor, after all. Passive marketing refers to the process of creating a LinkedIn company page, building a following for your brand, and regularly optimizing your website. It’s considered a form of pull marketing because here, you rely on the decisions of other people to actively search for you. In return, you give people what they want and what they need, including good service and high-quality content. By satisfying the needs of people, you are then building your credibility as someone who delivers. This reputation, as well as recommendations from past customers, will then drive traffic to your page. On the other hand, aggressive marketing in LinkedIn simply means that you are very productive when it comes to business opportunities. You post status changes very frequently, do everything you can to engage your followers, post new and compelling content regularly, reply to queries as soon as possible, use tools for advertising, upgrade to a premium LinkedIn membership, and the list goes on. Of course, with aggressive marketing, you need to set limits so as not to run the risk of looking and sounding like a spammer, especially when you’re sending out ads and messages. Still, professionals love this form of marketing because it encourages interaction and a more casual environment. In the world of LinkedIn, both forms of marketing are beneficial to your business, regardless of the company size and budget. There are few risks as well. You just need to strike a balance between the two. So far, you’ve learned what LinkedIn is all about how to create a company page for your business in LinkedIn, and the two forms of marketing that you should consider doing. Now, you need to learn more about the best practices when promoting your business website through your LinkedIn company page. The most important of these practices is the optimization of your LinkedIn company page. This includes making sure that details about your business that are relevant to your followers are there, like business name, address, phone number, etc. Add a cover photo that will immediately attract people, as this is the first thing they’ll see when they access your LinkedIn page. Make sure that the content of the picture is related to your business. The dimensions of the cover photo are 646 pixels x 220 pixels. We’ve touched on the subject of “Products & Services” too, in which you indicate the kind of products and services your company offers. By doing this, you reveal the nature of your business, and then it becomes easier for people to search for you when they also search for certain goods. Another thing you can do is to personalize the URL of your LinkedIn company page. This is very easy to do by just accessing your account settings. It may not sound like a big deal, but doing so will further instill your brand in the minds of your followers. Plus, a personalized URL will be far simpler to memorize. Pay close attention to the content on your LinkedIn company page. Part of optimizing your profile is also optimizing all the content pieces that will be posted on it, from the status updates to the quality of the photos to the content on your blog, if you have one. Your status updates and blog posts should always be helpful and interesting to the reader, plus they should be related to your business. You can also use keywords as a means to increase your visibility and ranking on the SERPs, but be mindful that keywords alone do not have as much impact as high-quality content. The pictures that you post, especially your cover photo, should be eye-catching with just a slight touch of provocation to get people talking. If you look at the viral pictures and videos on the Internet today, you will be amazed at how these things can tell great stories at a glance. This is something that you should aim for: to post content that will engage your followers and other people. 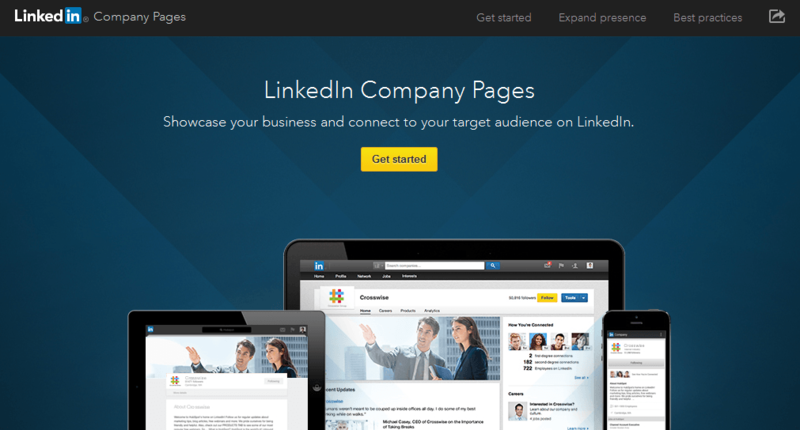 Cross-market your LinkedIn company page with other existing business pages. Since you want to increase your online presence and reinforce your brand effectively, you will need to make sure that the contents of these pages are similar to one another. Of course, this doesn’t mean that you should only Copy+Paste each of your content from one social site to another. What this means is that the content and business information found in these sites should be consistent, differing only in perhaps the manner by which you market them for different demographics. You can drive more traffic to your LinkedIn company page by connecting your other sites to it. This can be as simple as putting a LinkedIn follow button on your other sites. Plus, you shouldn’t forget to follow your other social pages. Use LinkedIn tools that are available to you. Most of these tools that you can use can be accessed by clicking on them on the dashboard. Aside from the “Products & Services”, you can click on the “Careers” tab to give a brief description on how your company operates, plus the work environment and culture there. The “Careers” tab also allows you to post notices about job openings in your company. On the other hand, if you want to focus more on specific products and services, you can use LinkedIn’s new Showcase page. This feature will allow you to create a spotlight page for your chosen goods. A LinkedIn Ads tool can help you start your own ad campaigns, which will help drive more traffic to your page and increase your site’s ranking in LinkedIn’s SERPs. You can easily see how your website is faring by clicking on the “Analytics” tab, also on the dashboard. This tool will show you your current page views, number of followers, and so on. While LinkedIn is a business networking site, this shouldn’t stop you from practicing your creativity. Remember that the purpose of a company page is to promote your brand, and this begins by engaging with other people. You can unleash your creativity in LinkedIn by simply posting content that will encourage the viewers to react to and share your post, and also the manner in which you facilitate conversations among your followers. You also need to post contents that are relevant and helpful for your audience. If your LinkedIn company page is composed of mixed demographics, you can separate them into groups. This way, it will be easier for you to post contents that are specific and useful for each type of audience. You can find more creative tips on using your company page here. Here’s a quick diagram on our company blackboard showing why LinkedIn is good for business. That pretty much settles why it’s worthwhile to check it out. LinkedIn is a great place to build relationships with influential professionals who have the money to buy your products and the power to endorse you to their other influential friends and colleagues. However, keep in mind that LinkedIn is not the only place where you can find your ideal customers and investors. If you want to truly build a bigger and more successful brand, then you should use other social networking sites in conjunction with LinkedIn. There are many others that have millions and billions of active users, like Facebook, Google+, Twitter, Pinterest… the list keeps on going.